GFWC is one of the world’s oldest and largest women’s service organizations dedicated to community improvement through volunteer service. GFWC clubs set their own agendas, work on projects and programs that address the specific needs of their community. GFWC clubs have access to tools and information that enable them to become effective grassroots advocates on public policy issues affecting families and communities. GFWC clubs are actively involved in supporting public libraries and public schools libraries. GFWC clubs benefit from material, resources, support and technical assistance available exclusively to members. GFWC members network and form lasting friendships with women across the country and around the world. 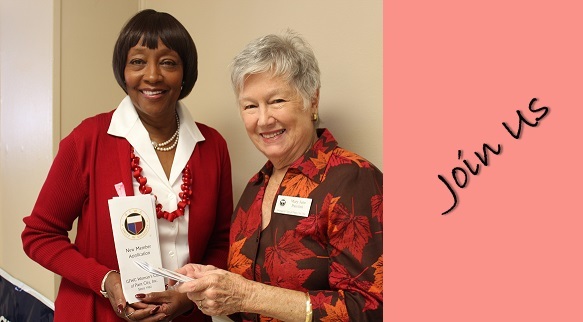 GFWC members of all ages have opportunities for personal growth and enrichment through leadership training and development. If you have the volunteer spirit, are looking for connections to your community, interested in meeting new friends and ready to have some fun, GFWC has it all and MORE! Note: Membership must be sponsored by two active members in the Plant City Woman’s Club.